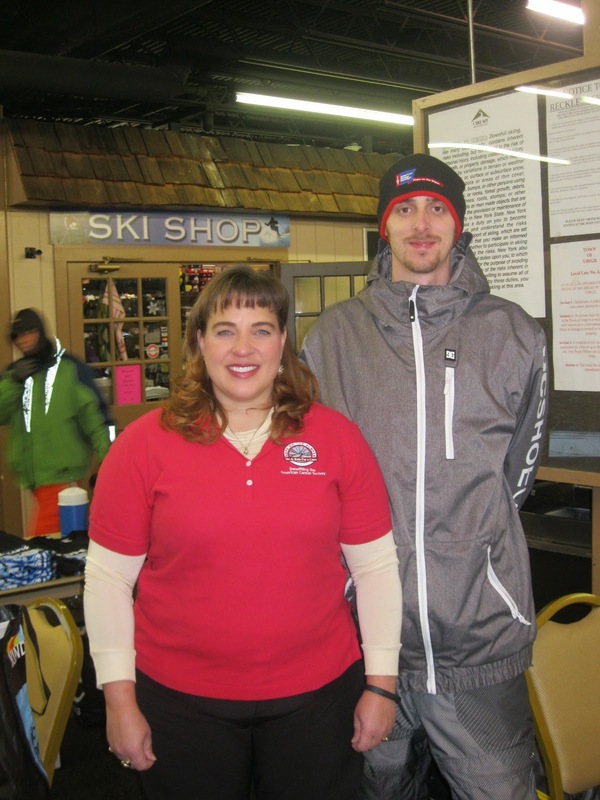 Greek Peak has hosted Hope on the Slopes - Ski and Ride for a Cure for the last two years. This is an event to raise support for the American Cancer Society to find a cure. Today was the day of the event for this year. As I entered the lodge this morning I was pleased to make my contribution to the cause and chat with Charlene Piercy, Executive Director of Hope on the Slopes. Along with her assistant Devon she was welcoming the skiers who had sponsors and of course willingly accepting contributions for the cause. It was a chilly day, but the sponsored skis were truly dedicated to getting as much vertical as possible to bring in the bucks. After bibbing up and getting their transponders to measure the runs, they were out on the slopes. Conditions were fabulous. Many slopes were groomed to perfection. And with the latest natural snow there were fun stashes to slice through. It is heartwarming to recognize the dedication of the skiers who spent their day giving back and at the same time enjoying snow sports. Would it be that all of us could both enjoy our activities and give back as well. Cancer has probably touched almost everyone of us in our lifetime. Either through our own personal battle or through the challenges to our friends and loved ones. Honor to those who fight for the cure. Meanwhile, it was a fabulous day on the slopes. Sorry my fellow Deer Valley instructor Holly & I missed you over the weekend! The family we were skiing with had a blast & looks like they may become Greek Peak regulars. They were bowled over by the friendly people & the "rock star" treatment of their instructors by the Geezer crowd. Please thank everyone on our behalf. We may not get back again this year, but the family is already planning 3 trips for next season!